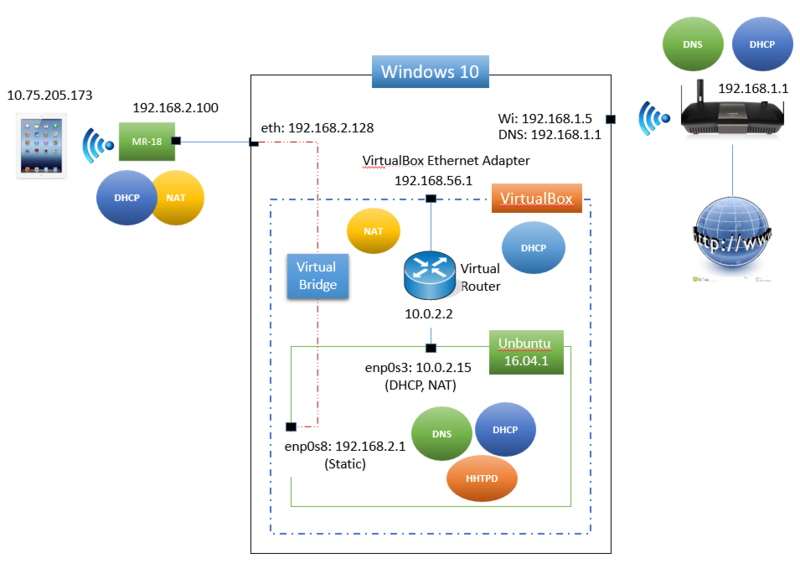 I’m trying to build a Hotspot with a WIN 10 laptop, a Cisco Meraki MR-18 Access Point (AP), an Oracle VirtualBox 5.1.4, and Ubuntu 16.04 LTS, running as a Virtual Machine (VM), to service the incoming wireless connections. The laptop has a physical Ethernet port connected to the MR-18 AP and a wireless connection to the Internet. The Problem: From an smart device, I can establish a wireless connection through the MR-18 AP, open a SSH session, connect to an HTTP server on the Unbuntu VM, or PING (thus resolve) any domain name. However, the MR-18 AP keeps reporting having ‘No Internet’ and if I try to open any URL on the IPAD’s browser, this will not work. VirtualBox creates the first net adapter and assigns IP address: 10.0.2.15/24 and Default Route: 10.0.2.2/24 to Ubuntu’s interface enps03. This is the connection to the Windows 10 Host OS. The 2nd VirtualBox net adapter is defined to establish a bridge between the laptop’s physical Ethernet port and the 2nd Ubuntu’s enps08 virtual Ethernet interface. This is the connection to the MR-18 AP. 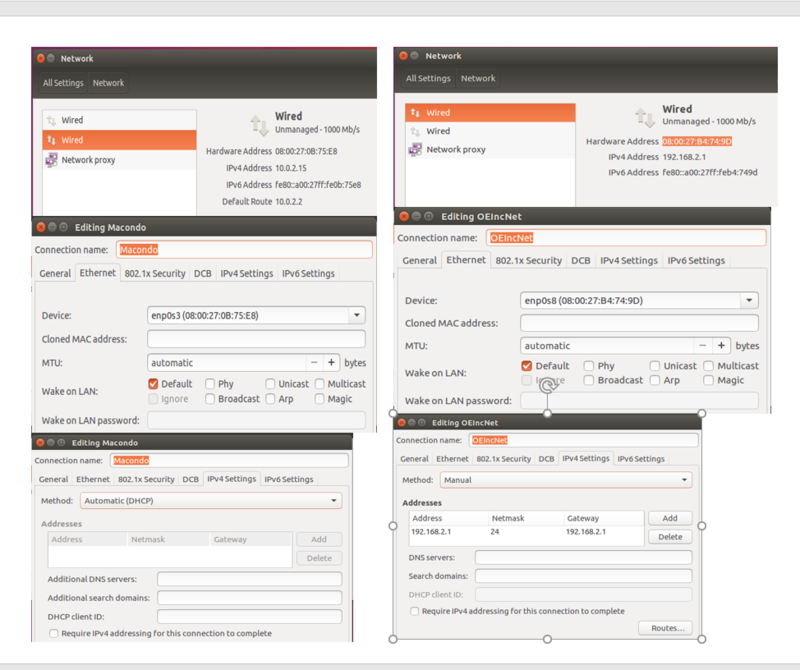 After creating these two network connections on Ubuntu, none of the two virtual Ethernet interfaces appears on the /etc/network/interfaces file; however, the first interface enp0s3 is UP and running and communicating with the host OS as per ifconfig. The second virtual interface enp0s8 will go UP and running once it is declared on the interfaces file. Ubuntu’s dnsmasq is configured to service DHCP and DNS requests on 2nd interface enp0s8, therefore it will assign an IP address and a default route to the MR-18 AP. Browse other questions tagged dnsmasq virtualbox-networking or ask your own question. Can I use systemd-resolved to send some traffic to a certain iface?